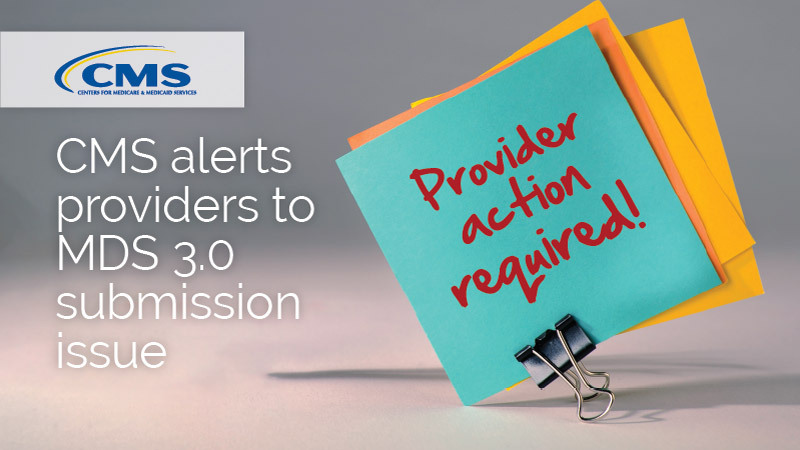 CMS has alerted us to an issue within their ASAP (Assessment Submission and Processing) system that affects the calculated RUG rate of certain MDS 3.0 submissions. Here’s what you need to know. What MDS files are affected? Does this affect all providers? Yes, all providers are affected, regardless of whether you use SimpleConnect™ to manage your MDS workflow or submit MDS batches directly to CMS. You’ll need create modification records for all assessments submitted between Oct. 1 and Nov. 4 (with a target date of Oct. 1 or after), then submit them to CMS. No changes are required within the assessment; it only needs to be submitted as a modification. This will allow CMS to correctly recalculate RUG values as well as store accurate data for reporting. Important: Do not submit the original record a second time, as it will be rejected as a duplicate. What MDS field values were affected? Specifically, this involves the submitted values for M0300B1, M0300C1, M0300D1, and M0300F1 for NO and SO assessment records. The values were not stored in the CMS ASAP system, despite being required for the NO and SO assessment record. Since the data was not properly stored, related RUG calculations were affected for this time period. If you have any questions, contact the QTSO Help Desk at help@qtso.com or 888.477.7876. So all MDS from 10-1-16 thru 11-04-16 need to be Modified and resubmitted,? correct? Yes, you’ll need create modification records for assessments submitted between Oct. 1 and Nov. 4, then submit those to CMS.